How can you use the iPad in your organization? What's the formula for a successful iPad deployment? What do you need to know about security, HTML5, and custom apps? 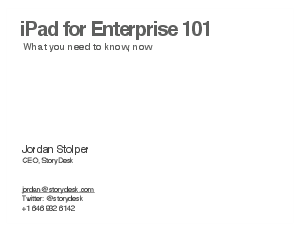 Answers to these questions and more in iPad for Enterprise 101 - What You Need to Know, Now. This white paper explains how to put the iPad to work in your company. It's an ideal, easy-to-read primer for both non-technical and technical executives trying to make sense of how their enterprise can take advantage of a technology that's changing the way we do business.